We left Friedrichshafen Friday afternoon about 1 pm. Our train went west along the Bodensee, curved south around the northwestern arm, called Überlingen See, to Radolfzell, then west again to Singen, where we changed trains to one bound north through the Schwarzwald. Schwarzwald, the Black Forest of Hansel and Gretl and many other fearsome tales of our childhood. My notes of this first part of the journey are more concerned with the lady whose dog got loose in the Singen train station than with any fearsome fables. It wasn’t until I noticed the upcoming stop at Donaueschingen that I started paying closer attention to the world outside my window. Donau!!?? That’s the German word for what we Americans call the Danube. I always associated that river with Austria and points east. What’s it doing in southern Germany? Well, it turns out that Donaueschingen is known as the source of the Danube. The whole time we went through Donaueschingen, I was watching carefully for a river of any size. Nothing. After we got out of the town, we went along a nice valley that had a little stream in it that seemed little more than a canal that toy boats could sail in. Later I came to find out that the Danube is formed from two rivers coming together at Donaueschingen. They are named Breg and Brigach. Brigach was the one we were passing along. Well. The countryside was beautiful though and some hills were starting to show. Within 15 minutes we were at St George (Sankt Georgen) amongst some serious forest. We left the river course then for some tunnels and steep valleys. Good stuff! St. George, Triberg, Hornberg, Hausach, Haslach, Biberach. All set in what my map tells me is Naturpark Schwarzwald Nord/Mitte. I would like to come back here. Around Biberach we noticed that this train had a stop scheduled in Rastatt. Why didn’t Wilfried tell us to go there instead of Baden Baden? Frantic texts, emails, attempts to phone ensued. Finally Mary got through and found out that the Baden Baden Hbf is closer to their house than the one in Rastatt. OK. The last few stops before Baden Baden were approximately 30 seconds each with the train accelerating to around 90 mph for only 4 or 5 minutes in between. And very smooth. Wilfried had mentioned earlier in the week that he and Elisabeth had a social engagement Friday night that they couldn’t get out of: a dinner at their neighbor’s. Mary and I thought they would go and leave us at their house. When we got to Wilfried’s, it was 5 pm and Elisabeth had the table all set with 4 giant pieces of cream cake and wine. We hadn’t eaten a proper lunch again so we fell to with gusto. After a while, someone said, what time are we expected at the neighbors? Answer, 6 pm. I looked at my phone: 5 minutes til 6. So now it develops that we were expected all along to join them so get your coat on, we’re going. Never mind that I felt like I would never eat again. I should have known. We had a lovely dinner at Felix and Yolanda’s. Neither spoke much English but we got along. The food was great: Felix barbequed sausages and chicken kabobs outside in the rain while the rest of us sat around the table and talked and drank. Back at Wilfried’s about 10 pm, he brought out a special 16 year old Spätlese Reisling and we sat around and talked some more until past midnight. What a day! Friedrichshafen is a city on the Bodensee, which English speakers call Lake Constance. Bodensee forms part of the border between Germany and Switzerland. I’ve always found it interesting how place names can change so much from one language to another. Paris is always Paris, but in France, London is Londrés. Anyway, Bodensee sounds cooler to me so that’s what I’ll use. Our original plans for sightseeing in the Munich (München) neighborhood included going to see Mad Ludwig’s castle at Neuschwanstein. At Marlies’ house, Mary Sullivan told us the story of her and Tom’s visit there the week before. It was a nightmare of trains, buses & walking that took up more than 12 hours. The tour of the interior of the castle was an hour. She didn’t think it was really worth it with so many other things to see. 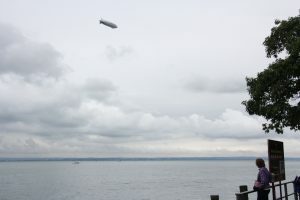 While we were mulling that information, Marlies told us of a flight she took over the Bodensee in a Zeppelin and how awesome that was. It was expensive but seemed much more interesting to me. I had been harboring hopes of going back to Bodensee anyway. Mary Beth said she’s seen the world from 1000 feet but I said not Bodensee and the Alps. So she signed on. We made the reservation for Thursday afternoon. Wednesday afternoon as we were walking to the hotel in Muncih, Mary’s phone rang. It was the Zeppelin people. Thursday’s flight was cancelled due to bad weather. Would we like to reschedule for Friday morning? Yes! OK, that’s fine. We can go to the Zeppelin Museum in the afternoon, take the flight in the morning, and get the train to Baden Baden in the afternoon. We’ll be at Wilfried’s before dinner time. 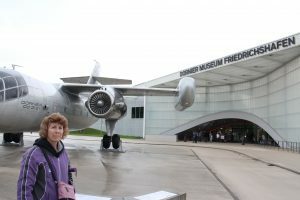 When we arrived in Friedrichshafen at about noon on Thursday, we could see why the flight had been cancelled. There was a heavy drizzle and the clouds were so low we could barely see the water of the lake from a block away. The Alps on the other side? Forget it! And the Zeppelin people called again. The Friday morning flight was cancelled. We were sad but not surprised. You wouldn’t have been able to see anything. At the hotel, we got a map of the town and I noticed another air-related museum. Claude Dornier was a German aircraft designer of the middle 20th Century based near Friedrichshafen. His museum was near the airport, a short train ride away. We decided to go there first and go to the Zeppelin Museum the next morning. Actually, we looked in on the Zeppelin Museum after lunch. It’s right on the water in the Old Town area of Friedrichshafen. It was mobbed. It made sense. The weather was bad and everyone wanted to be inside. We took the train to the other museum. For dinner, we went back to the promenade along the lake and found a restaurant with 2nd floor tables overlooking the lake. The clouds had lifted somewhat and we could see the setting sun shining through the gaps lighting up the Alps. Sehr schön, as they say in Germany. Sadly, I had left my camera in the hotel room. Mary got some pictures but I don’t have copies yet. Stay tuned! In the morning we went to the much-less-crowded Zeppelin Museum. Zeppelin, of course, was the airship builder of the early 20th Century. We call them blimps but the craft Zeppelin built were much more than that. Zeppelins had regularly scheduled routes from Germany to the US, to South America and all over Europe in the 1920’s. The best known example of a Zeppelin is the Hindenburg. The largest such craft ever built, it caught fire and burned in 1937 as it was docking in New Jersey. 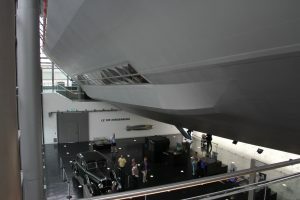 At the museum, they have a full sized replica of part of the Hindenburg. They also had a smaller display of the Hindenburg in comparison to other famous large aircraft. The Hindenburg dwarfed them all. Sorry no photo of the smaller scale models. Maybe Mary has one . . . When we got out of the museum about 11:30, practically the first thing we saw was the new, tourist, Zeppelin flying over Friedrichshafen. I guess the clouds lifted enough. Here’s Mary watching it fly away. Perhaps I should have known. 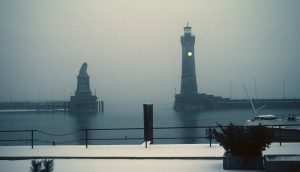 My other visit to Bodensee was in January 1982. We stayed in Lindau, just a little east of Friedrichshafen, which has a famously beautiful harbor. Visibility was poor that time too.